A smart home really helps you setting up the comfort of the home. Imagine coming home to a pre-cooled room after a hard day at work, walking in by waving your phone to unlock the door, playing your favorite song in any room with a click. Your lights could dim on their own in the night to help you relax and go to bed soon, and brighten up gradually in the morning like an ambient alarm. The market for smart homes has been growing steadily and their primary aim is to make living more affordable, comfortable, convenient, secure, entertaining, and sustainable. Powered by gadgets and computing technologies, smart homes were only considered for the very rich in the past — but not anymore. Today, smart home technologies have become affordable and every other average household uses some form of smart home automation or the other. Smart home as an end product from developers are also drawing more buyers in urban India. In integrated townships, smart home features are an expected advantage and considered a desirable part of the overall product offering. Smart home products not only make your life safer, more convenient and more fun, they can also help you to save energy and money. Citizen research conducted by Schneider Electric in 2015 revealed that the need for safe and secure homes is one of the strongest drivers for home owners to consider buying a Smart Home. This single concern is resulting in the growth of Smart Homes as a category. However, now customers are also looking to buy Smart Homes for other aspects such as comfort and energy efficiency. Smart homes were previously marketed as homes with advanced security features like cameras, smart door locking systems and similar surveillance. Over the years, we have seen the technological improvements in smart homes now including electronically enabled lighting systems, fire detection systems, gas leakage detection, energy efficiency monitoring, entertainment systems, and so much more. The market for smart homes is still growing. In tier 1 cities, the uptake of smart homes is increasing by between 15-18 per cent and by between 5-10 per cent in tier 2 and tier 3 cities. The key driver for this market increase has especially been driven by the increase in the number of working couples with dual incomes in metro cities. With both spouses working, a family is financially capable of opting for a smart home. Smart homes do cost a bit more than homes without smart features. The idea of buying a Smart Homes is very positive in urban India. In upper end homes (ie. outlay of more than INR 5 cr. ), almost all home owners want to have Smart Homes. In metros even in middle level homes (ie. sub INR 1 cr outlay), many customers want to go in for Smart Home solutions. In non-metros, there are however a few instances of customers who do not want Smart Homes. For these customers, the key barriers are a fear of higher prices and a concern that they weren’t clearly aware of tangible benefits from Smart Homes. For the average buyer of a smart home, the unit home must above all include electronic security features. Energy efficiency and consumption is another aspect that is becoming increasingly popular among home buyers. People are willing to spend more for a smart AC, smart TV or a smart refrigerator. Water consumption is also considered important when buying a smart home. 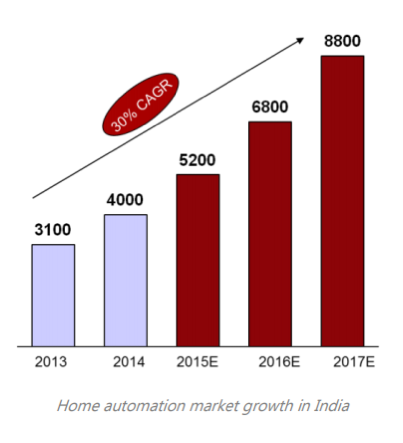 RedSeer’s report titled “Home Automation in India” highlights the growth in the home automation market. Home automation could have well been a part of science fiction many decades ago, but is a reality today. Home automation has its roots in smart home appliances which has over the years led to the development of integrated smart homes. 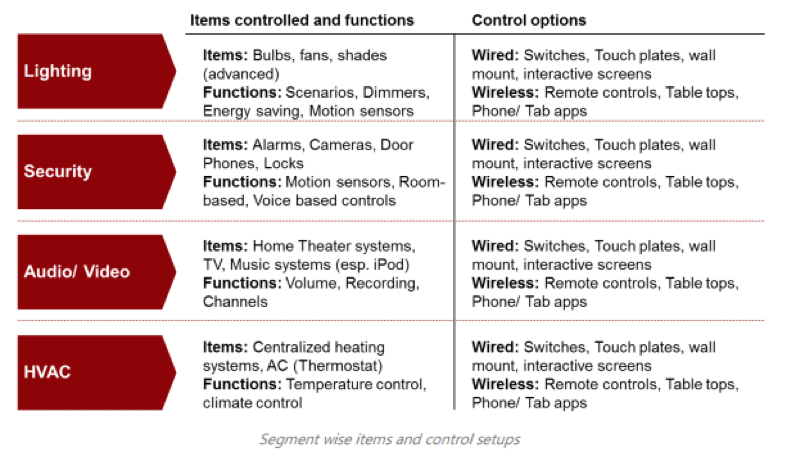 Home automation today largely consists of four functional segments – Lighting, Security, Audio/Video and HVAC (Heating, Ventilating and Air Conditioning). Residential usage is the highest in the market and accounts for nearly 60% of the home automation industry. 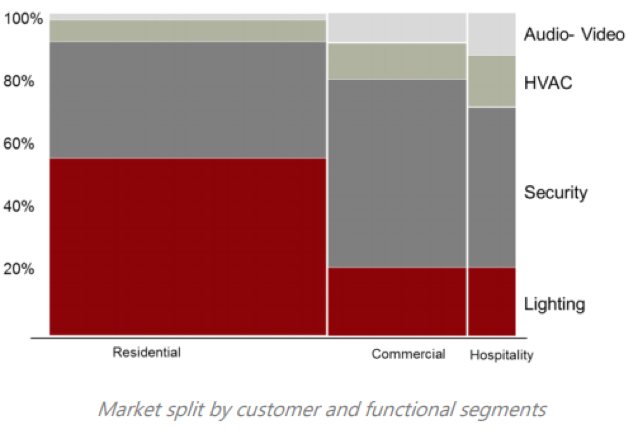 It can be seen from the chart that lighting is the largest component of the residential market while security is the largest component of the commercial market. 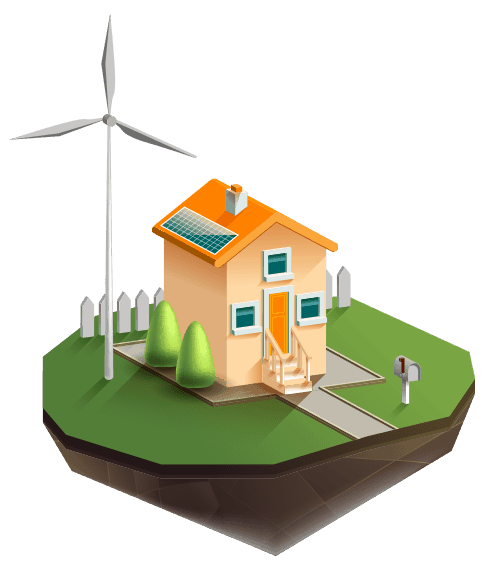 The professional team at Energy Bots has the solutions to convert your existing home into a s mart home without the unnecessary need to purchase a smart home. We will provide you with the solutions to monitor your energy and water consumption, how you can improve your consumption and put money back into your pocket. Our devices and sensors can help you turn your home into a smart home. Our solutions and products give you the peace of mind and savings so that you can enjoy your lifestyle. Plus your efforts will be contributing to reducing the carbon footprint. Our ePlugs and eSwitches are the ideal products that will help you start saving valuable money and conserving energy. Our eBot technology is the latest on the market and will help you understand your electricity consumption and will give you the solutions to reduce energy. Ourtechnology allows you to be able to remotely control when you turn on and off your lights and appliances.